Jay Brodsky '00 can tell you what life was like before the World Wide Web went mainstream. Shortly after receiving an applied science degree from the University of Pennsylvania in 1991, Brodsky was working as an operations/marketing manager for Interactive Media in Cedar Rapids, Iowa. At the time, the most advanced media technology available was a voice-processing product called "audiotex," which allowed Brodsky to create prerecorded messages about the news and make them accessible to users via phone. But when the World Wide Web took over the media landscape, Brodsky's job was turned on its head. "People needed that same sort of news content, but on the Web, instead of the phone," he says. "Suddenly, the Internet made my work make sense." More than a decade later, Brodsky's work hardly resembles that of his audiotex days. Now serving as chief information officer for Atlantic Media Company in Washington D.C., he directs technology efforts for publications such as The Atlantic, National Journal and Government Executive. In the midst of a poor economy and dying media market, Brodsky is tasked with finding ways to use the Web to keep Atlantic Media's publications relevant while holding fast to its roots and mission. The solution, Brodsky says, is remembering why these publications were published in the first place. The Atlantic, for example, was launched in 1857 by a group of Boston-based intellectuals, including Ralph Waldo Emerson and Henry Wadsworth Longfellow, who needed an outlet for exchanging ideas. "They [published] it to start a public debate and get people thinking about ideas, sharing their thoughts and having some back-and-forth discussion," he says. So how do you recreate that same environment today? "Blogs. It's today's way of getting intellectuals together to express their opinions." 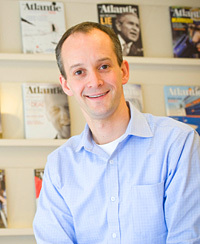 Before joining Atlantic Media in 2007, Brodsky directed technology operations for the digital media operations of National Public Radio for two years and at Tribune Media Services in Chicago for more than 10 years. He enrolled in the Kellogg School's Part Time MBA Program while working full time in order to broaden his skill set and advance his career at the Tribune Company. The degree had an added bonus: Post-graduation, Brodsky used the Kellogg directory to connect with an alumnus, who helped him land a position with NPR. Along with beefing up blog content, Brodsky has spent the past two years supporting The Atlantic's online efforts by posting issues to its free-access Web site. While some industry experts say the move is risky — given its potential to reduce subscription numbers — it has broadened the magazine's readership. Circulation is projected to be up 12 percent, from 400,000 in 2008 to 450,000 in 2009. (By contrast, newspaper circulation dropped 5 percent in 2008, compared to 2 percent in previous years.) In addition, a digital version of The Atlantic is available for download on Amazon Kindle, a wireless reading device. However, Atlantic Media's readers are somewhat divided when it comes to certain features on the Web. For instance, when Andrew Sullivan, one of The Atlantic's most popular bloggers, polled his readers about whether he should add a "comments" section to his blog, 60 percent voted against it. The Atlantic's readers also appear "most interested in words," Brodsky says, as opposed to podcasts or videos, although a video of a reporter interviewing Bill Cosby generated a fair amount of traffic on the Web site. And while more people are reading online versions of the magazines than ever before, there are still a large number of subscribers who prefer to read them in print. "In some cases," Brodsky admits, "[reading a magazine online] isn't quite as compelling as sitting on the couch with a cup of coffee and thumbing through the latest issue."